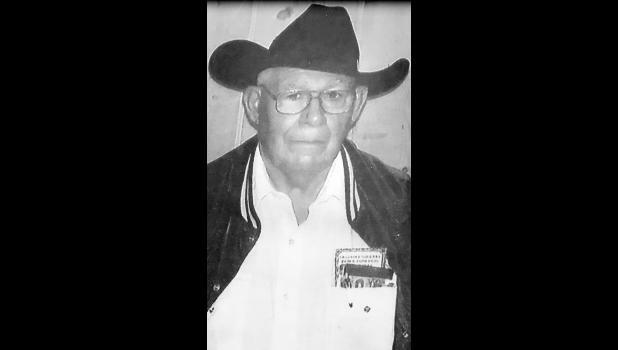 The Rodeo and Sale Barn World lost a great man, as John B. “Jake” Jacobsen, 89, rural Delia, passed away Saturday, Dec. 15, 2018, at his home. He was born July 3, 1929, the oldest son of Clyde F. and Marguerite Crouse Jacobsen, at Fairmont, Neb. He grew up in the Fairmont community and lived in Nebraska until moving to Kansas more than 60 years ago. He and his wife Pearl along with their family owned and operated Jacobsen Rodeo Company for many years. They provided rodeo livestock in Kansas, Oklahoma, Iowa, Nebraska and Missouri. Jake was an order buyer. He had worked in the ring at livestock barns in St. Marys, Emmett, Marysville, Frankfort, Onaga and at both barns in Holton. He raised horses and cattle. Jake gathered cattle by horseback many years. He was a member of the Delia Presbyterian Church and was a past member of the Fairmont Methodist Church. Jake was a member of the Eagles Lodge, I.O.O.F., SCA, URA and IRA, the Kansas Livestock Association and the Jackson County Livestock Association. A grandson gave him the nickname of Albert, which stuck with him as many family members called him that. Jake loved his family. He was preceded in death by his parents and brothers, Francis, Bill, Floyd (Karen) and Glen. He was also preceded in death by Mark Morgan, whom he considered a son. On March 1, 1947 he was united in marriage to Pearl McDonald at Geneva, Neb. She survives of the home. Other survivors include his son, Dale (Carolyn) Jacobsen, Circleville; his daughter, Bonita “Sis” (Wilbur Jr.) Stum, Topeka; four grandsons; 10 great-grandchildren; 10 great-great-grandchildren; three sisters-in-law, Beverly, Jean and Pat Jacobson; and several nieces and nephews. Memorial services will be held at 10 a.m. Saturday, Dec. 22, 2018, at the Holton Livestock Exchange Sale Barn, Holton. Inurnment will be held at a later date in Nebraska. The family will receive friends from 5 p.m. until 7 p.m. Friday, Dec. 21 at Piper Funeral Home in St. Marys.